The Moving Average Envelope system has an entry based on the price breaking out of an upper or lower envelope created by a percentage of a simple moving average. As the price breaks out of the envelope, this EA opens a new position to catch a trend if the price continues to move. The SMA in the middle of the envelopes is used as a trailing exit when the price reaches it. Note that the envelopes must be set for each timeframe and symbol as they are not dynamic to set the correct envelope range around the price. 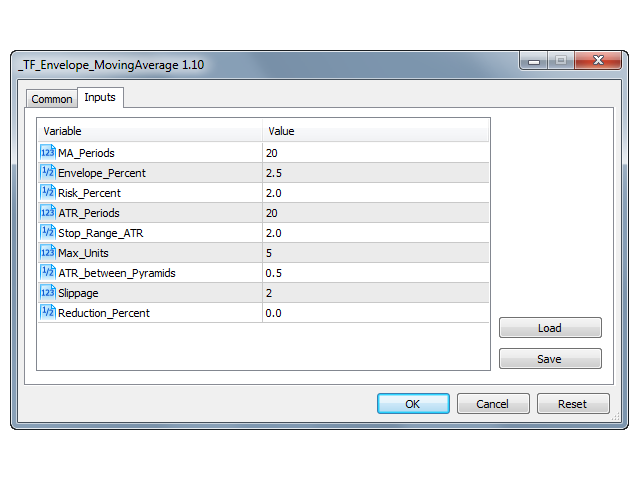 Use our free Moving Average Envelope indicator on your chart to find the appropriate percentage for your chart. Exits are trailing with the simple moving average in the middle of the Moving Average Envelopes. For long positions, the EA exits when the price reaches or goes below the moving average. 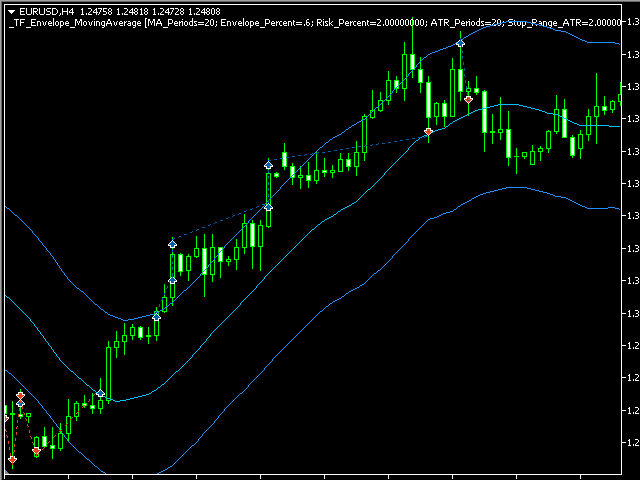 For short positions, the EA exits when the price reaches or goes above the moving average. This EA calculates the position sizing using the Percent Volatility method which is directly tied to the stop. The stop uses the ATR_Periods and Stop_Range_ATR inputs to calculate the ATR and then multiply the two values to set the stop distance from the entry price. Stops are not coded into the position but this EA closes out the position if the price reaches the stop value. As additional units are added through pyramiding, the stop moves to correspond to the latest entry price. Using the stop value, the Risk_Percent input, and your account information (tick size, lot size, digits, etc. ), the position sizing uses the monetary value of the distance from entry to stop and keeps the number of lots limited to the percentage you specify. MA_Periods: The number of bars used to create the simple moving average in the middle of the envelopes. Envelope_Percent: The percentage of the moving average to add to the moving average to create the upper and lower moving average envelopes/bands.